October 1, 1991 I dreamed I was visiting a friend in a nearby hilly and forested housing development located about 10 minutes from my home in town.A tall thin man in his late fifties was doing some yard work around my friend's place while my friend and I were chatting. He stopped what he was doing and with rake in hand came right up to me, looked me in the eye and very calmly announced: "I'm going to kill you." I became frightened and wanted to get away immediately. I jumped into my pickup and drove quickly back to town. Then I woke up. At first, my only thoughts were of relief having escaped the dream and finding myself still alive. Then, with my eyes still closed, I did something I had never done before. I wondered what would happen if I let myself fall back into the dream. I thought: "What if I were to let him kill me?" I instantly fell right back into the dream. At once, I found myself in my backyard, just outside the entrance to NFMOA, facing east. The "Gardener" was walking toward me with a huge machete in his hand. He proceeded to slice me up into long strips and then fed the strips into a shredder, turning me into mulch. Then he shoveled the very small pieces of me around the base of some young morning glory vines growing nearby. I suddenly realized that I was coming back to life in or as the flowering vines. I had never felt so happy and peaceful. Then the Gardener with his wife,and I with my wife, who was the dark undulating earth, all smiled and danced for a very long time. When I finally awoke from the dream, I was thrilled by the power of the Gardener's Dream! I actually felt that I had died, been shredded into pieces and had been reborn as plant-life, as morning glory vines and flowers. I had not been simply reborn . . .I had become plant-life! And I realized that as a plant form I was not just one isolated being, one lone plant . . . rather I was alive in all morning glories everywhere! I could not recall ever having felt such boundless joy! I knew I had to respond to this dream, to anchor it in my life. I searched my studios and storerooms for objects and materials that could carry, embody and present the Gardener's Dream as a permanent 3-dimensional object. After briefly digging through my collections of junk and treasures, I found just what I needed and I began work immediately. I worked on The Gardener's Dream sculpture every day for 7 - 10 hours for the next two months. It was completed on November 30, 1991. 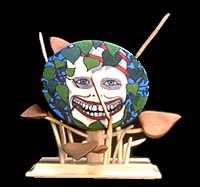 The Gardener's Dream sculpture is a painted wood construction, very detailed and stands over 5 ' tall. It has a 16 " square base.